Presumed adult Heuglin’s Gull (“taimyrensis” form), seen from Highway 17 on the estuary at approximately Km 121. Living and birding in England for many years until 2005, I saw most of the gulls on the British list at one point or another. I used to enjoy scanning the vast gull flocks at Dungeness looking for a stray Caspian Gull, Yellow-legged Gull, or a winter Glaucous Gull. However, the identification and taxonomy of large gulls is not a subject that one has a lot of opportunity to get involved with in southern Taiwan, where they are generally very scarce winter visitors. Driving south on Highway 17 on Tuesday afternoon, I was crossing a big river bridge at about Km 121 when my eye was caught by an adult gull on the estuary below. Even before I even stopped the scooter, my immediate reaction was that it was very dark on the mantle. The bird was wary, and I wasn’t too far away from it, but it was reluctant to leave the dead fish it had found. The mantle was a slaty-grey in color, several shades darker than on the Mongolian Gulls I had seen earlier in the day. 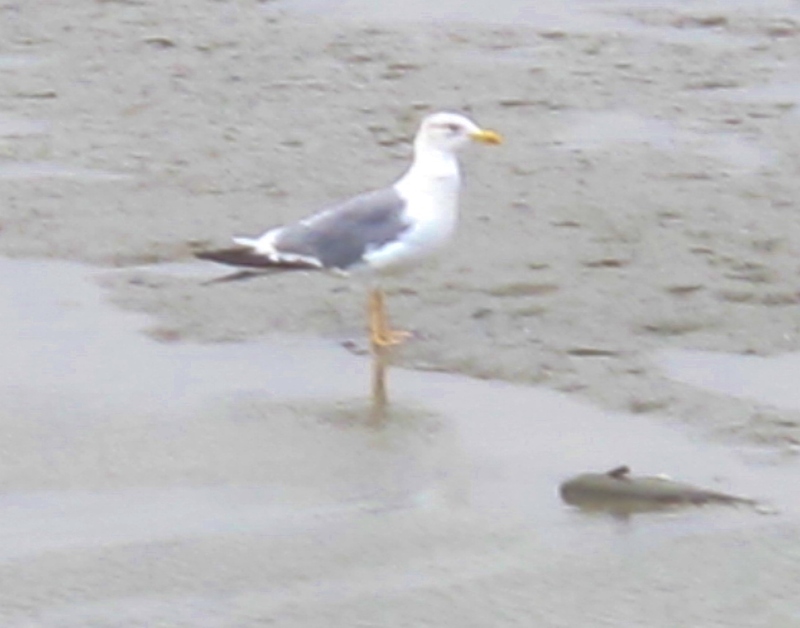 Its legs were very bright yellow-orange, again quite unlike the dull pinkish legs of Mongolian Gull. The wings appeared especially long, another feature good for Heuglin’s Gull. Scanning identification papers and photos on the internet when I got home, the only feature that was perhaps abnormal for taimyrensis Heuglin’s Gull was the very white head (Heuglin’s Gull typically shows a lot of head flecking in winter), but there is much variation between individuals; this bird could have just been very late moulting out of breeding plumage. According to the literature, the taimyrensis form of Heuglin’s Gull is a regular but uncommon winter visitor to Taiwan. The science of large gulls is very much a work in progress, but I am happy for now to be able to add it to my life list. It’s my first lifer since Slaty-legged Crake back in August. In other news, visits to Cheting, Qigu, Budai and Aogu today produced a respectable total of 70 bird species. Perhaps noteworthy were a Black-faced Bunting and two Daurian Redstarts in the coastal forest at Qigu, two Ospreys on the estuary there, and a couple of Greater Painted-Snipes flushed from marshes along the Qigu embankment. At Budai, two adult Mongolian Gulls, 12 Common Pochard, a Garganey and a Richard’s Pipit, plus a huge flock of at least 800 Whiskered Terns resting on the marshes near Highway 17 at Km 134.5. At Aogu, no sign of the reported Hooded Crane, but plenty of wintering birds including Avocet and Black-headed Gull. Of interest to birders visiting from overseas, Black-faced Spoonbills are currently common and easily found at all the sites mentioned. Lifer: Heuglin’s Gull (total 1,790). A significant change in the weather on Monday, with much cooler air across southern Taiwan, raised hopes that something good might finally have arrived at Qigu. Nonetheless – being well used to disappointment at Qigu over the last few weeks – I reined in my enthusiasm, slept a little later than usual, had a leisurely breakfast, and finally arrived at the coastal forest at 9.30am. Initially it didn’t look promising, with no birder’s cars parked at the site – which is usually an indication that nothing much is around. The first part of the forest seemed quiet, with the only bird of note a female Daurian Redstart. Then, near the pond, a lone Taiwanese photographer (English name Gordon) got me onto a bird he had just found. After something of a team effort, we managed to get reasonable views of a beautiful adult male Mugimaki Flycatcher. It was very mobile and stayed high in the trees, often obscured by branches, making photography difficult even for Gordon’s long lens. Already the trip was worthwhile, and I wandered off along the eastern shore of the pond, where two male Daurian Redstarts were chasing each other around, and then an ever better bird appeared – a female Red-flanked Bluetail giving great views perched on a fallen log. I went to find Gordon, who managed some excellent shots of the bird. My favorite area of Qigu coastal forest is also the area that is hardest to access, because it’s the part that’s covered with the most driftwood and damp gullies. It’s about two-thirds of the way through the forest, on the landward side, and today it seemed especially sheltered from the breeze and rich in insects here. In one small area, I quickly found two Yellow-browed Warblers, a second Mugimaki Flycatcher (this one a female), an Arctic Warbler, and outstandingly a Goldcrest, which was calling frequently and keeping to the tops of the pines. I went to fetch Gordon again, who spent an hour or so at the spot and eventually came away with some very satisfactory photos of this difficult-to-photograph species. Goldcrest is a rare migrant in Taiwan, especially so in the south of the country. Leaving the forest, a drive along the length of the Qigu embankment produced a couple of Richard’s Pipits, another Daurian Redstart, and plenty of extremely distant Black-faced Spoonbills and Caspian Terns on the mud. At Cheting Marshes, halfway back to Kaohsiung, I spent an enjoyable twenty minutes in the viewing tower, from which large numbers of herons, ducks and other water birds can be easily seen. Perhaps notable were three Garganey, an Avocet, two Whiskered Terns, plenty of Sacred Ibis, a Eurasian Kestrel, and a beautiful Long-tailed Shrike. Taiwan ticks: Mugimaki Flycatcher, Goldcrest (total 261).